Explore vocabulary by defining words via movement. Your students will perform a series of zany movements -- each representing a new vocabulary word -- in a fast-paced sequence of keep up. Throughout play, you’ll learn new words and have plenty of time to explore definitions. You can even play Word Jam with your own custom content! Note: Word Jam is a GoNoodle Plus game and is only available if you have access to GoNoodle Plus! Learn more about GoNoodle Plus. Help students get vigorous exercise. Use physical activity to engage your classroom. At the start or finish of a reading or writing lesson. After recess, when transitioning back into learning. As a start or end to the school day. When reviewing for a test or quiz. Note: Word Jam does not work on mobile devices or tablets at this time. This activity can only be played when using a desktop or laptop computer. Developing a strong vocabulary promotes reading comprehension and improved communication between students and teachers. Students need multiple and various exposures to a word before they fully understand that word and can apply it. Ask students to stand and get ready to move. Choose Built-In or Custom mode. Built-In gets you playing right away. To create custom vocabulary lists, see Adding Custom Content to Word Jam below. Copy the movement on the screen and connect the definition to movement. Continue through the levels, with each adding a new word and quicker transitions. Review the summary of words at the end. Word Jam was designed with ELA experts to help teachers explore and expand vocabulary using kinesthetic learning. Research shows a high correlation between vocabulary and academic success. Students who have a broader vocabulary tend to be better readers, and better readers tend to have more academic success. Word Jam explores vocabulary in a unique and memorable way that your students will love. 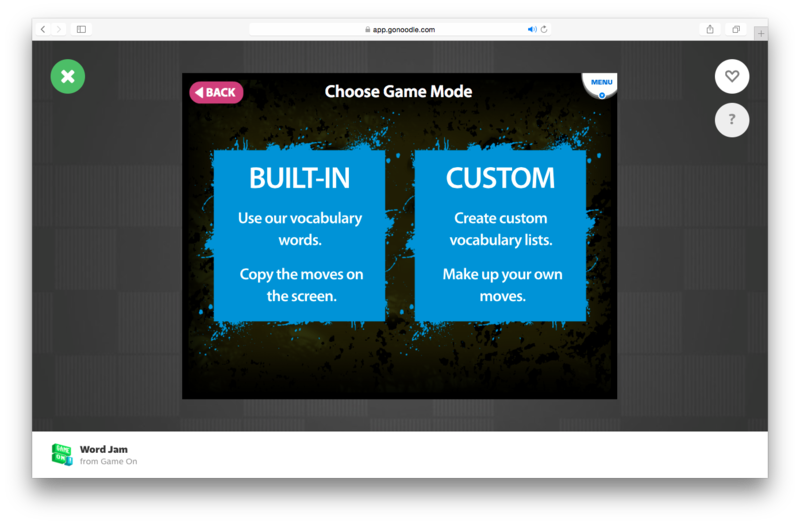 Word Jam includes more than 600 vocabulary words, with K-8 grade appropriate content. The selected vocabulary intentionally includes a high percentage of Tier 2 or academic vocabulary words to support the expansion of student vocabulary across disciplines, many of which are multiple meaning words. The remaining Tier 3 or domain-specific vocabulary words reinforce key vocabulary in mathematics, science, and social studies. The Common Core State Standards stress the importance of vocabulary acquisition and fluency, especially in the Language Standards. 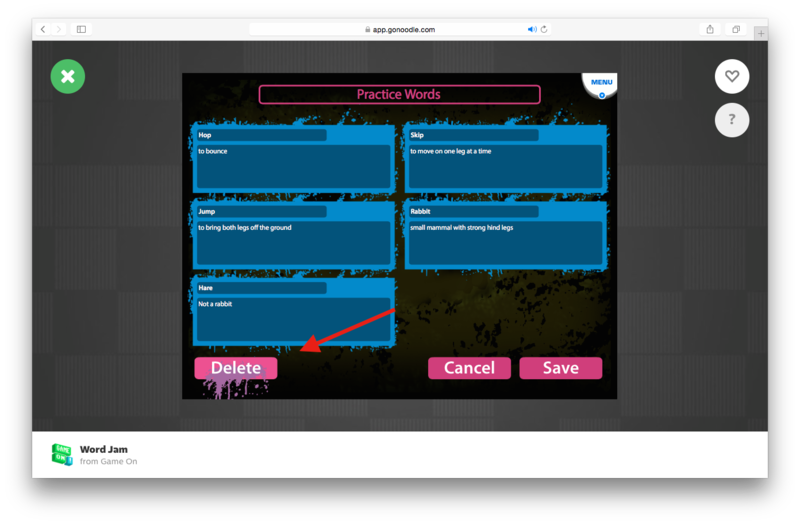 When played in Built-In mode, Word Jam will present words based upon your grade selection until your class has seen all grade appropriate words, at which point future plays will randomize the words you’ve already played. Agree on the move in advance. Before each round of play, Word Jam shows the word and definition. This is an opportunity for the class to review the word and define a movement for that word as a group. All-class Freestyle! Alternatively, the teacher might let students create their own movement to the word in the natural course of play. Every kid in the class may define a word via movement differently. On the review screen at the end of the game, the teacher can facilitate a class discussion about the movements they created for each word. Note: To use Custom Mode, you must create custom vocabulary lists. You can create up to 14 at one time. Lists can be edited or deleted later. 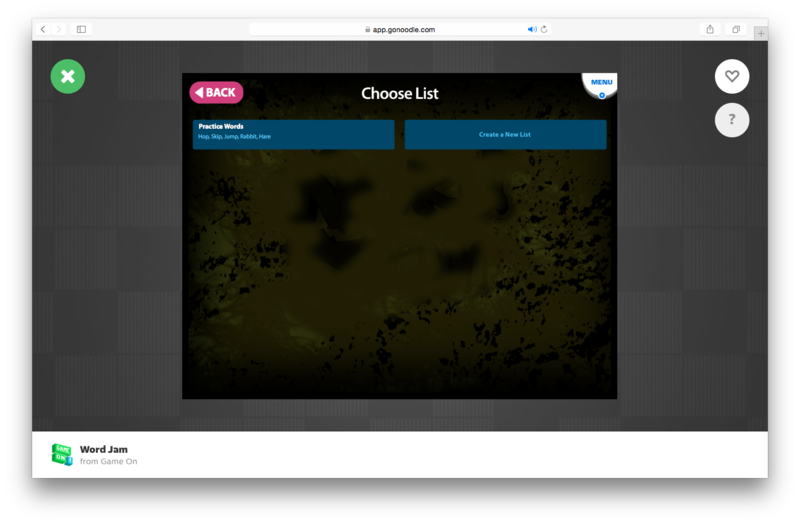 Once you have created custom lists, choose Custom on the main page to select a list for play. Custom lists contain five words each. Name your list. Add your custom vocabulary words and definitions. If you want to play with your new content immediately, click Play. If not, click Back to return to the custom lists page. Click the list you want to edit or delete. Edit as desired, then click save. Click the delete button to delete. Note: Clicking delete will remove your list. This cannot be undone. To reset the game, click Reset on the main Word Jam page. Resetting allows you to choose a grade again and deletes the progress you have made through the auto lists. It does not remove your custom lists.. Note: Resetting cannot be undone.